Custom cabinets can be defined as units that are made individually and to exact sizes. Much different than stock cabinets you would buy from a large supplier; custom cabinets can be made to fit any size opening without the use of unsightly filler pieces. A human rather than a machine on an assembly line makes each piece. Consequently, this ensures that each unit is very strong and stable and will last for a lifetime. What is the difference between “Stock” cabinets and “Custom” Cabinets? The main difference between stock cabinetry and custom cabinetry is the size limitation on stock cabinets. Stock cabinets are made in bulk to standard measurements. For example, if you had an opening that was 56 3/4″ and you were using stock cabinetry, you would have to get a 52″ cabinet and use filler pieces to close the remaining gap. We can make you a custom cabinet that fit that opening exactly. Another huge difference between stock and custom cabinets are the options available for stock cabinets. Most stock cabinets only have a few material, finish, and size options. We can mix and match wood types, stain colors, and countertops when needed. Often time’s stock cabinets don’t have these options. Is custom cabinetry more expensive than stock cabinetry? One major misconception about the custom cabinetry industry is price. Some people believe that custom cabinets are out of their budget range and don’t even bother pricing custom cabinets. This may be true in some cases, however generally custom cabinets are very competitive on pricing. When comparing prices you should look at all the options that custom cabinets provide as opposed to stock cabinets. For the most part custom cabinets are stronger and more stable making it possible for them to stand the test of time. When you factor in quality you are getting much more for you money with custom cabinets than you are stock cabinets. Always remember that cabinets are an investment not an expense. Beautiful cabinetry will raise that value of your house tremendously. Will I have to hire an installer to put in my new custom cabinets? No. 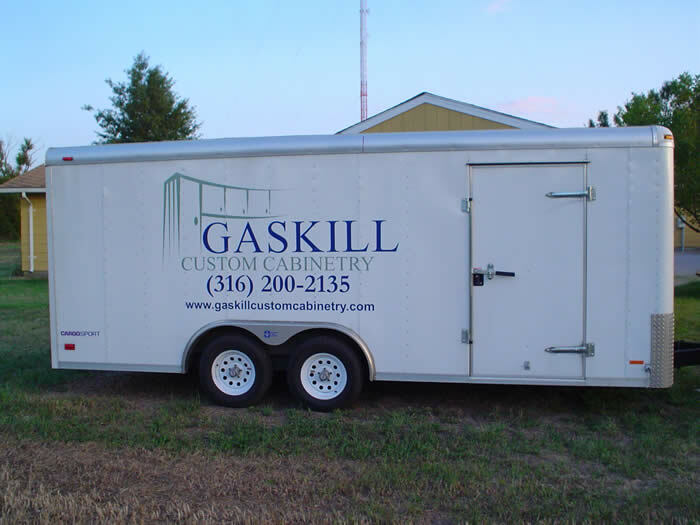 One major difference between Gaskill Custom Cabinetry and some large distributors (Home Depot, Lowe’s) comes in the installation aspect. Included in every bid is an installation fee. We install all of our own work. This ensures that the cabinets are installed correctly and look perfect upon completion. Often if you have one place build the cabinets and another install them, the builders tend to get sloppy and pass the problems on to the installers. How can I make the design process quicker? It is very important to educate yourself on what your style is and how you want to incorporate it into your new project. There are so many options with custom cabinets such as hardware, wood type, door styles, and countertop options that you will want to familiarize yourself with in order to have an idea of what you want. Throughout the design process we will help you make all of these decisions according to your wants and budget. The more pictures and ideas you have, the easier it is for us to give you what your really want. What are the steps involved in a custom project? Find out what you need or want. Research and find ideas to give us a better understanding of your wants. You contact GCC and we set up a consultation appointment. GCC designs and draws your project. GCC contacts you and we set up an appointment to review your bid proposal. If accepted, you sign the bid sheet and half of the bid is due to start the project. GCC builds and installs your custom project. The remaining balance is due at the end of installation. I am interested in having Gaskill Custom Cabinetry build a project for me, what are the steps I need to take to start the process? Within 2 business days we will respond and set up an in-home consultation.